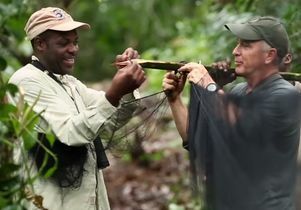 UCLA professor Tom Smith (right), who has spent three decades doing research in the Congo, and Kevin Njabo, a Cameroonian biologist who is also an assistant adjunct professor at UCLA. 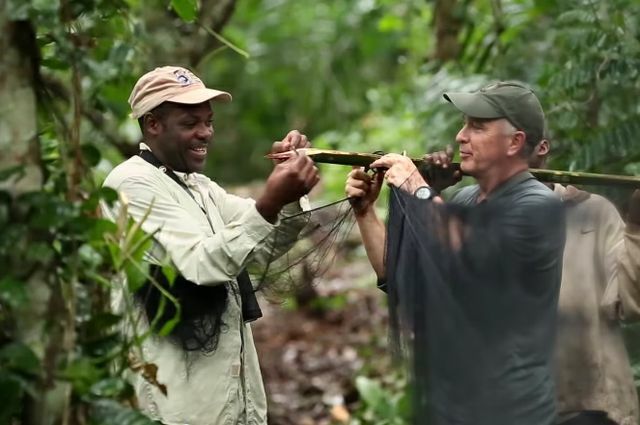 UCLA professor Tom Smith has conducted research in Cameroon for more than 30 years, and preserving and improving the region is more than a career to him. It’s his life’s work, and now he and a major African institute have created an international partnership that could save the Congo rainforest and transform the troubled Congo Basin. On June 20, Smith and the International Institute of Tropical Agriculture (IITA) launched the Congo Basin Institute. More than 200 officials including ambassadors, ministers, African scientists, UCLA researchers and representatives of universities from around the world gathered at IITA in Yaoundé, Cameroon for the event. The Congo Basin Institute at IITA will provide a one-of-a-kind center to address the challenges of food and water security, climate change, biodiversity loss, public health and emerging diseases. Cameroon is a microcosm of the world’s environmental challenges, giving researchers an opportunity to study and test solutions to address deforestation, mining, fast-growing urbanization, poverty, poaching, lack of sanitation and clean water, infectious diseases and more. “This is a game-changer for the Congo Basin,” said Smith, an evolutionary biologist in the UCLA College and director of the Center for Tropical Research at UCLA’s Institute of the Environment and Sustainability. The new institute is a partnership between UCLA and IITA, one of the world’s largest tropical agriculture agencies with more than 20 stations and campuses across Sub-Saharan Africa. While UCLA has agreements with more than 300 international partners, the Congo Basin Institute is UCLA’s first foreign affiliate, meaning the university will have a permanent presence in Cameroon. The distant Congo Basin affects lives from Cameroon to California. The 1.4 million square miles of Congo rainforest — the second largest in the world after the Amazon — inhales massive amounts of carbon, keeping it out of the atmosphere and slowing climate change. All that is threatened by deforestation, Smith said. The region is also home to many emerging and infectious diseases, such as the recent Ebola outbreak that found its way to a hospital in Texas, he added. The institute seeks to address those and other societal challenges, while also slowing the brain drain of African scientists relocating to more developed economies, Smith said. Currently, only 20 percent of the young scholars who go overseas for higher degrees return. A five-year test version of the Congo Basin Institute successfully hosted more than 2,000 researchers from 15 countries at the IITA campus, assisting the scientists with obtaining permits, cobbling together grants and more. UCLA students studying conservation biology, public health and medicine are among those who have already had the opportunity to use the site for field research experience and to study tropical diseases. 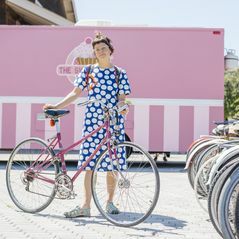 Like Smith, UCLA environmental health professor Hilary Godwin hosts a number of programs there, and also teaches a distance-learning class that takes place simultaneously at UCLA and at IITA in Cameroon. Key to the success of the pilot program and the new institute is Kevin Njabo, a Cameroonian biologist who is also an assistant adjunct professor at UCLA. Njabo was instrumental in working with the Cameroonian government to lead the effort to protect the area and in getting the city of Yaoundé to host the Congo Basin Forest Partnership meeting. The new Congo Basin Institute aligns with and expands upon UCLA’s Sustainable L.A. Grand Challenge, a university-wide research initiative to develop clean energy, local water solutions, and preserve biodiversity in order to transition the Los Angeles region to 100 percent renewable energy, 100 percent local water and enhanced ecosystem health by 2050. U.S. Ambassador to Cameroon Michael Hoza met with the organizers June 19 in support of the launch of the institute. 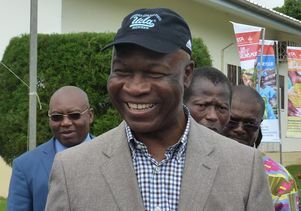 The launch event the next day was attended by Essimi Menye, Cameroon’s minister of agriculture and rural development, and ambassadors from other African and European countries. Key representatives from UCLA and IITA also attended, including Mark Gold, UCLA’s associate vice chancellor of the environment and sustainability, and Kenand Namanga Ngongi, vice chair of the IITA Board of Trustees. Also attending were Kevin Reed, UCLA vice chancellor for legal affairs; Kenton Dashiell, IITA deputy director of general partnerships and capacity development, Bernard Vanlauwe, director for IITA’s Central Africa Hub and Rachid Hanna, resident representative, IITA-Cameroon. The new Congo Basin Institute is expanding the existing IITA campus, and the launch event marked the addition of a GIS (geographic information systems) and remote-sensing laboratory, and a molecular genetics laboratory. The architecture firm Gensler has completed pro-bono designs for green buildings to enlarge the campus with a conference center, a distance-learning center, and lodging for visiting students and researchers. Together, the facilities will enable scientists in Cameroon to develop global-scale solutions related to agriculture, health, human resource development and more, Ngongi said. “These will impact the lives of millions of people in the Congo Basin and also contribute to the sustainable management of the Congo Basin ecosystem,” Ngongi said. In addition to providing state-of-the art facilities, the program will assist researchers with permits, finding grants and other logistics. It will be funded with a fee-for-use charge that proved successful in the pilot program. Long-term, Smith has also partnered with the government of Cameroon and several non-governmental organizations in an effort to get a large swath of the Congo protected by the United Nations’ Reduction in Emissions from Deforestation and Forest Degradation program. The REDD program funds alternative land uses for people who might otherwise live off the Congo through poaching or deforestation, but it’s unusual for a professor to lead the charge, Gold said. “I’ve never heard of a professor creating the largest REDD project in Africa to protect biodiversity and develop an institute like this,” Gold said. Additional partners in the Congo Basin Institute include the World Agroforestry Center, the Centre Pasteur du Cameroun, the University of Wisconsin-Madison, the University of New Orleans, Drexel University, several Cameroon ministries and universities, and other corporate partners and local and international NGOs, such as the Jane Goodall Institute, and the Center for International Forestry Research. UCLA professor Tom Smith and Kevin Njabo, a Cameroonian biologist who is also an assistant adjunct professor at UCLA. 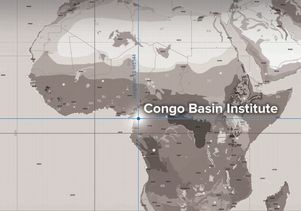 Map pinpointing where the Congo Basin Institute, launched June 2015, is located.